Radio-Tone Two Way Radio Over Zello RT- RoIP1. 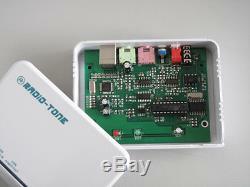 The RT-RoIP1 is a state-of-the-art radio over IP network controller. It is employed advanced digital voice processing technology to interface with most popular voice messengers for bridging 2 or more radio networks. It is an easy of operation, cost effective and highly flexible platform for extending communication range by linking conventional two-way radio into a radio over IP network system. This terminal is used to connect the RT-RoIP1 to an USB port of computer. (Without connect analog cable when connect USB). This terminal is used to connect to the speaker out of computer. This terminal is used to connect to the microphone input of computer. This VR is used to adjust the link signal trigger level from USB and analog inputs. DIP SW1 : Radio Unit PTT Control Mode Selection. OFF for PTT Mode 1. ON for PTT Mode 2. DIP SW2 : Audio Input and Output Selection. This terminal is used to connect to a radio unit. 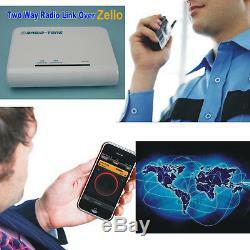 The item "Radio Channel Talk To Your Smart Phone Over The World Via Zello RT-RoIP1" is in sale since Sunday, October 23, 2016. This item is in the category "Business & Industrial\Facility Maintenance & Safety\Surveillance & Alarm Equipment\Two-Way Radios". The seller is "radioshop888" and is located in default, default. This item can be shipped worldwide.